If only Volkswagen's management had heeded this ad. A brand's reputation exhausted. Will Volkswagen recover? If only the management of Volkswagen had heeded that advice before they decided to fit the ‘defeat’ chip in their diesel cars to be sold in the United States. Of course, they didn’t promise more, they promised less – fewer deadly Nitrogen Oxide fumes, in fact. Apparently, the reason given for this decision was that it would cost an extra £200 per vehicle to ensure that diesel cars sold in the United States met the stringent standards demanded across the pond in ‘real world’ usage. That £200 is now looking incredibly cheap compared with the looming fines and lost business that Volkswagen currently face. Worse, from an advertising point of view, is that decades of trust generated by what has consistently been the best advertising by any car manufacturer now lies in tatters. On my coffee table I have the latest edition of ‘Remember those great Volkswagen ads?’ It contains page after page of wonderfully witty, yet honest, VW ads dating back to the early sixties. 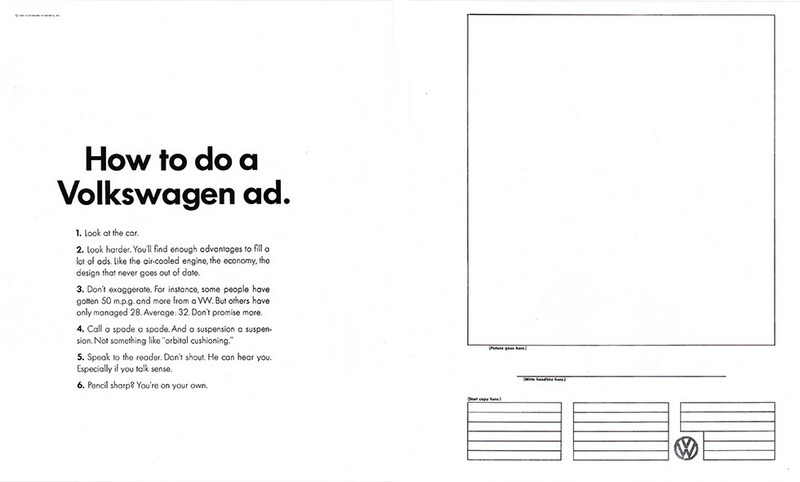 These ads are the work of Doyle Dane Bernbach and the great creative people who worked there over 50 years ago. They formed the blueprint for all the VW advertising that followed, advertising that had truth and honesty at its core. Now that advertising heritage would appear to be worthless, or at least greatly devalued. Whether it is beyond repair remains to be seen. I know one thing. I wouldn’t like to be in the shoes of the copywriter who is asked to write the next Volkswagen ad. Where would you start? 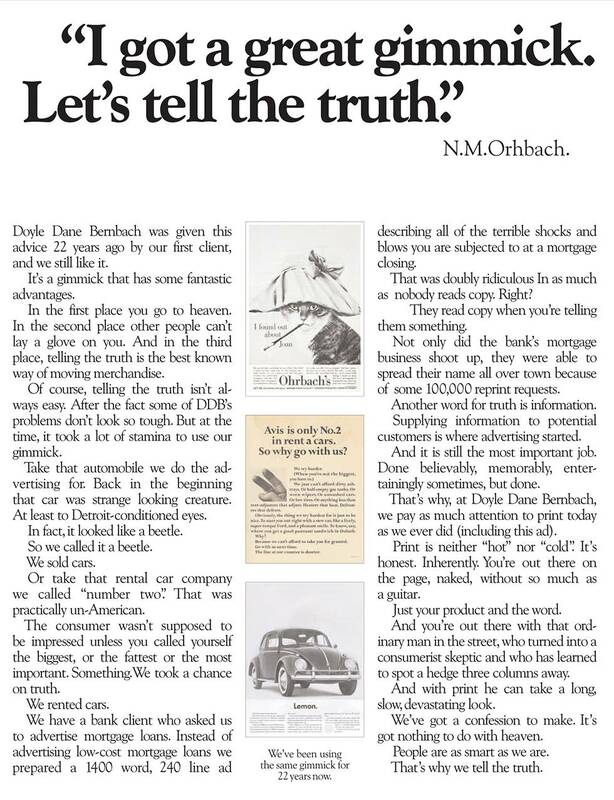 Ironically, Doyle Dane Bernbach wrote a house ad years ago that featured as the headline a quote from the agency’s first client, N. M. Orbach: ‘I’ve got a great gimmick, let’s tell the truth.’ I bet that’s a gimmick that Volkswagen now wish they’d employed – rather than a piece of software that cheated on their customers’ expectations.